Kicking Horse sits eight miles outside Golden, B.C. It's very seldom in life that something is even better than you expected. I was lucky enough to have that experience on my adventure to Kicking Horse Mountain Resort on the outskirts of Golden, British Columbia, last month. Let's face it: Winter started off a little slow here in the Inland Northwest, which led me to start researching ski reports and watching weather maps in search of fresh powder. With continual snowfall hitting the Selkirk-Purcell range around Kicking Horse, it was time for another road trip north. Kicking Horse sits approximately 8 miles outside of the historic railroad town of Golden, just off the Trans-Canada Highway, a scenic 5½-hour drive from the Spokane/Coeur d'Alene area. Back in the late 19th century, the Canadian Pacific Railway constructed its cross-country network of rails, using Golden as its base camp as it expanded further into western Canada. The railroad is still deeply embedded in the community, but the town of Golden has transitioned into a destination retreat. Nowadays the winters around Golden are busy, with snow sports enthusiasts visiting the area in search of powder in the Purcell Mountains. Kicking Horse overlooks the town. Its highest peak is just over 8,000 feet, and it averages more than 23 feet of blower powder annually. Mix in 2,800 skiable acres of some the most exciting inbound terrain you'll ever find, and you're in for a great time. "The size and variety of terrain at Kicking Horse is incredible," says Tommy Frey of Hayden Lake, Idaho. "There's terrain that will test the best of abilities, and plenty of other runs on the lower portion of the mountain for the beginners and intermediates. It really has something for every level." With a high-speed gondola, three chairlifts and a surface lift for beginners, getting around Kicking Horse is easy, and with a vertical drop of more than 4,100 vertical feet (the fourth-longest vertical drop in North America), there's plenty of riding to be had. Not only is the terrain jaw-dropping, so is the scenery. "Kicking Horse is surrounded by five national parks. The views are unparalleled anywhere else. 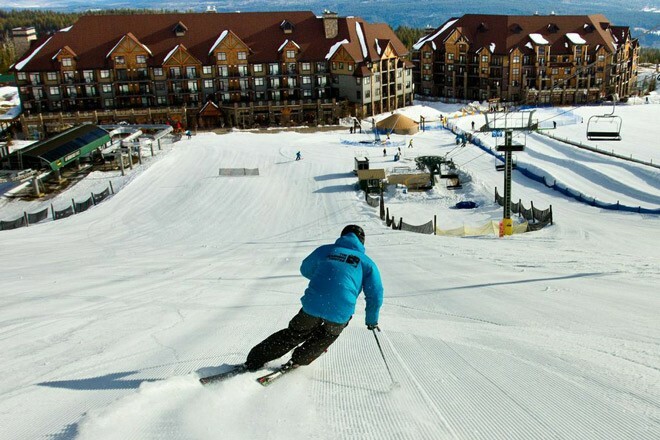 It's just amazing," says the resort's media marketing coordinator Andy Brown, who moved out to the Canadian Rockies several years ago from Ontario. "I grew up ski racing in eastern Canada, and when I ended my competitive skiing, I moved to Calgary to pursue an education," says Brown. "I started exploring the different resorts around the Calgary area, and once I discovered Kicking Horse back in 2003-04, it became my favorite place to ski. I was lucky enough to land a job here when I finished my education. There's no better place, in my opinion, than to be in these mountains." Whether you're an intermediate or an expert, the upper mountain has plenty of varying terrain, from wide-open bowls to gladed tree runs and steeps that would make a billy goat cringe. Kicking Horse is a rider's mountain, and with that kind of advanced terrain, it's no wonder that Ontario transplant Steve Fisk, another former ski racer, made it his home more than a dozen years ago. "I've been to a lot of resorts, and I have yet to find one resort that I like more than Kicking Horse," he says. "It has everything I want in a mountain, and the people who live here are passionate about skiing and living in the mountain environment." I'd say that Fisk made a wise decision as he gave us a tour of his playground. With six inches of fresh powder over the previous two days, Fisk led us into some sweet runs off the Stairway to Heaven chair along Redemption Ridge. It was here we dropped into the north-facing slopes called Feuz Bowl. According to Fisk, "this is where the snow always accumulates after any storm." This bowl definitely was holding the goods as we skied boot-top powder with lots of challenging, technical lines and plenty of hidden powder stashes. "Steep and deep" was the theme for our Sunday morning. Kicking Horse is a relatively new resort, opening in 2000. It has a nice selection of lodging choices, from hotel/condo-style rooms to private townhomes. If, like our crew, you want to be closer to town, there are several hotel chains to choose from. We opted for the Prestige Inn because of the pool and oversized hot tub, which we knew we'd need after skiing the steeps all day. The town of Golden has a good array of dining options, from elegant cuisine at the Whitetooth Mountain Bistro to good pub food with a fun ski-town vibe at the Taps. If you stay on the mountain, you have plenty of dining choices, including Kicking Horse Saloon, Peaks Grill or the Eagle's Eye, which sits at 7,700 feet atop CPR Ridge; you take the Golden Eagle Express gondola to the top of the mountain for a true mountaintop dining experience. The Eagle's Eye definitely has great food: I witnessed my friend Devin Dufenhorst devour the Alberta beef burger with pesto mayonnaise in record time! If I'd put my hand near his plate, I'd have drawn back a stump. Ski Canada magazine voted the Eagle's Eye the Best View from a Barstool — now that's my kind of establishment! On our final day, we were graced with semi-clear skies and just enough cloud cover to create an incredible sunrise. It was a spectacular first run, as we skied freshies down Briggs Brag in what seemed to be a surreal setting. It seemed that everywhere we skied, we were treated to great turns and plenty of soft snow. "I loved the snow quality, and the fact that there were so many runs that were challenging," says Spokane's Desiree' Leipham.